Lansdale Catholic’s Kristin Szczepaniak (no. 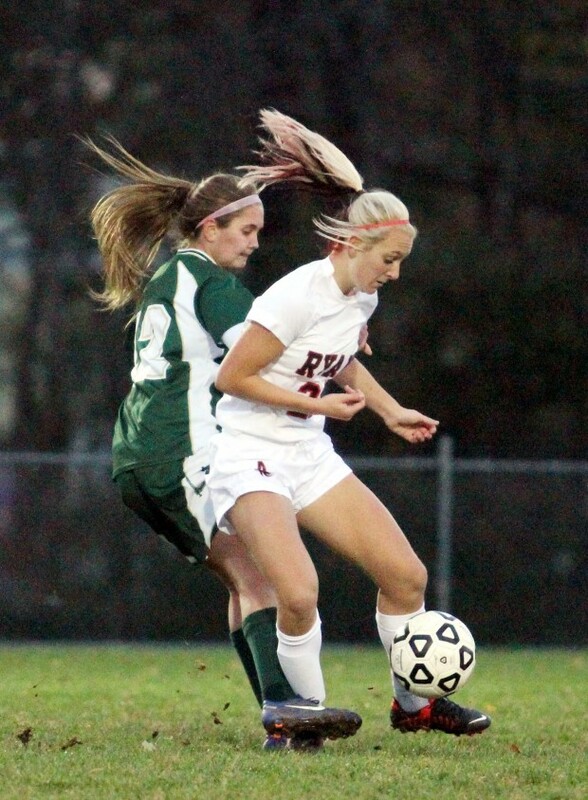 13, center) shows why the girls soccer championship was a classic, hard-fought contest. They ultimately leave almost every competitor in a post-game collective embrace, but for completely different reasons. Because in virtually every sport, just a few inches literally provide the difference between a celebrating champion and a lamenting runner-up. Cheers or tears. Indeed, a few inches can literally design an entire landscape. Wassel was referring to Wednesday’s Catholic League championship soccer contest between Lansdale Catholic and host Archbishop Ryan. Unfortunately for the Crusaders, their resilience and all-out hustle weren’t enough as Ryan captured a 3-1 victory. 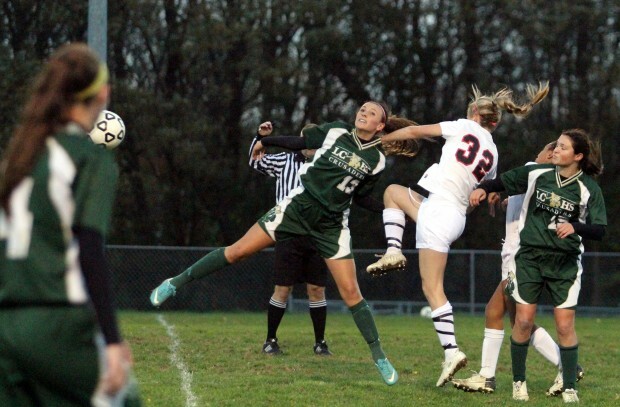 Reaching the league final for the third time in four years, Lansdale Catholic (15-5), which stunned three-time reigning champion Archbishop Wood, 2-0, in the semifinals, had nothing to be ashamed about. Since the beginning of the fall, 22 different teams have attempted to defeat Ryan. A 19-0-3 record later, that still hasn’t happened. What bothered Wassel, her teammates, her coaching staff, and her school community was that Lansdale Catholic really did play a great game – just not great enough to beat the state-tournament-qualified Ragdolls. So while Ryan moved on to play – and ultimately defeat – Public League champion Franklin Towne Charter in the Class AAA District 12 final the next day, Lansdale Catholic was forced to bid adieu to a season highlighted by the aforementioned upset win over Archbishop Wood. Late in the first half, an LC flurry almost resulted in the first goal of the game, but a crossbar got in the way. Obviously aware that their opponent meant business, the Ragdolls responded like champions by taking a 1-0 lead on four-year starter Scarlett Walsh’s tally from in close. Combining a near miss with a goal by the opposition just two minutes before halftime could have presented a deadly emotional beating for the Crusaders, but they were able to rebound impressively. Again, however, playing hard just wasn’t enough. Hoping to add some quick insurance to their lead, Ryan indeed scored early in the second half on a goal by sophomore Kaitlyn McFadden. A 2-0 deficit appeared impossible to overcome, but the Crusaders forged a late rally that energized their fans. With about 20 minutes left in the game, Whitby took a pass from Wassel and found the net to cut Ryan’s advantage in half. The LC crowd was buzzing, as were the Crusaders. Clearly with momentum, LC peppered the Ragdolls and a shot in close came within inches – there’s that dreaded word again – of tying the game, but sophomore goalie Jazmin Gonzalez whisked to the rescue in the nick of time. Ryan’s defense tightened, and with less than three minutes left in regulation, the Ragdolls iced the game on a goal by senior Brittany Robinson. The Ragdolls reacted as though they had just won the championship, and in reality, they had. In the game of soccer, scoring two goals in three minutes is like a baseball team needing six runs with two outs in the ninth, or a football team needing three touchdowns in the final five minutes. It just doesn’t happen very often, and this time was no different.